PRODUCT: 50 AMP, 125/250VAC, 3-POLE, 4-WIRE, CALIFORNIA STANDARD, LOCKING FEMALE POWER RECEPTICLE, PANEL MOUNT. PRICE/EACH. California standard Type 6369 twist lock female plug, 50 amp, 3-pole, 4-conductor. UL Listed. Twist lock design with heavy duty housing resistant to many chemicals and drop abuse. All brass mounting strap and grounding system provide low resistance and superior corrosion protection. Glass filled nylon body and face provide excellent impact, heat and chemical resistance. 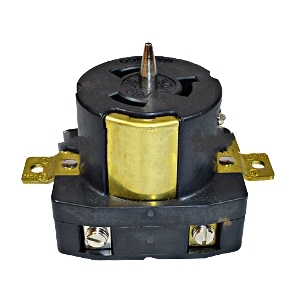 50 AMP 125/250 VAC TWIST TYPE LOCKING MALE POWER PLUG (CS6365 TYPE). PRICE/EACH.